Eggplants are fruits related to potatoes, tomatoes, peppers and tobacco. Known as the nightshade family, allergic reactions to this group of plants is relatively common. 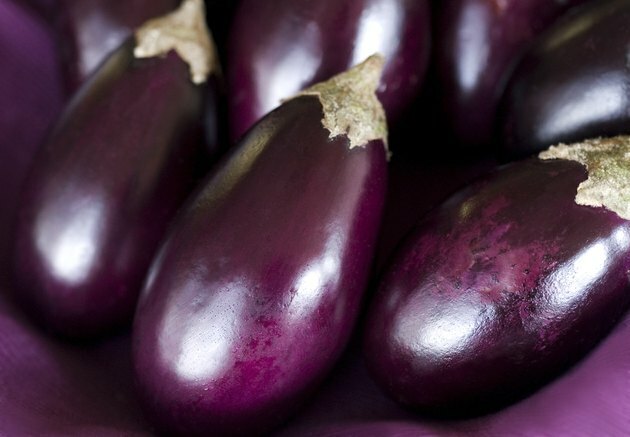 Although rare, allergies exclusive to eggplants may arise from a number of different factors. These include large concentrations of histamines, other alkaloids, allergenic proteins, phytosterols and pigments. Depending on your symptoms and the cause of your allergy, reactions to eggplants can range from mild to severe. If you experience allergic reactions to other members of the nightshade family, it is likely that you will react to eggplants. While certain allergenic proteins are not common to all members of the family, some are shared between two or more of these plants. These allergens can cause mild-to-severe reactions and may be immediate or delayed. To avoid future reactions, you should have a doctor perform allergy tests to ensure that your eggplant allergy is not a sign of a broader nightshade allergy. A group of symptoms known as oral allergy syndrome is common among fruit allergies. This syndrome is generally mild, resulting in itching, tingling and mild swelling on your lips, in your mouth and in your throat immediately after eating. These reactions arise from histamines, which are allergens common to hay fever, pollen and other seasonal allergies. Due to the large concentrations of histamines in eggplants, your symptoms should respond to antihistamines if you experience oral allergy syndrome. In the July 2008 issue of the "Journal of Investigational Allergology and Clinical Immunology," researchers at the Central Food Technological Research Institute in Mysore, India report on a number of eggplant-specific allergens. They note that most reactions arise from protein allergens unique to eggplants, with effects including hives, severe stomach issues and the life-threatening syndrome known as anaphylaxis. Though less common, these researchers suggest that some non-protein compounds in eggplants may cause allergic reactions. These include the pigments that provide the fruits with their color and phytosterols, steroid-like compounds that are naturally present in many plants. Alkaloids are a class of potential allergens that mostly consist of nitrogen atoms. While the allergenic effects of histamine alkaloids are well-established, a variety of other alkaloids are present in nightshade plants. Among eggplants, these include solamargine, solanidine, solanine, solasodine, solasonine and trigonelline. Although these compounds may not cause allergic reactions, large doses can lead to toxic reactions. These include sleepiness, diarrhea, vomiting, dizziness and stomach pains. As cooking reduces their alkaloid content, you should extensively cook your eggplants to avoid a potentially toxic reaction.